There’s something about white picket fences and clapboard cottages that makes us nostalgic for a time when children’s laughter rang in the streets and locking the front door was unnecessary. 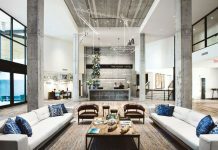 Those wholesome neighborhoods seem to have gone the way of the leisure suit, but not in Sunset Key. 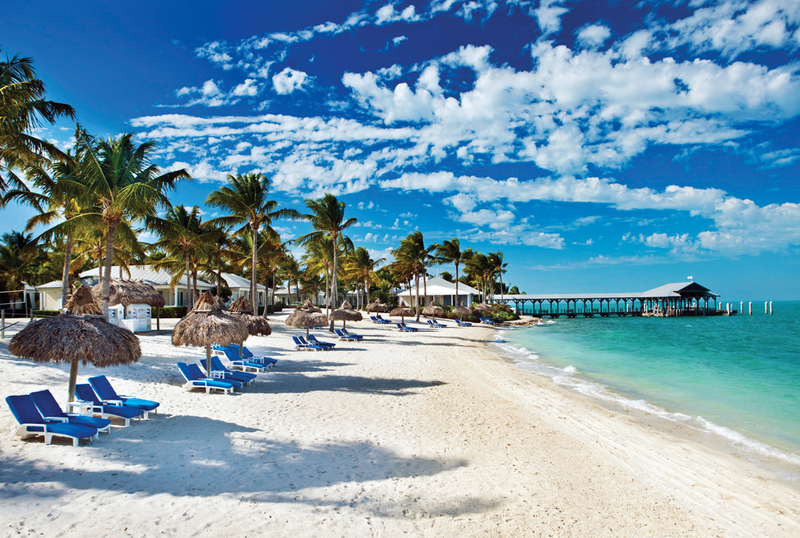 The tiny private island off Key West marries the idyllic, family-centric lifestyle of a bygone era with all the little luxuries of modern island living. 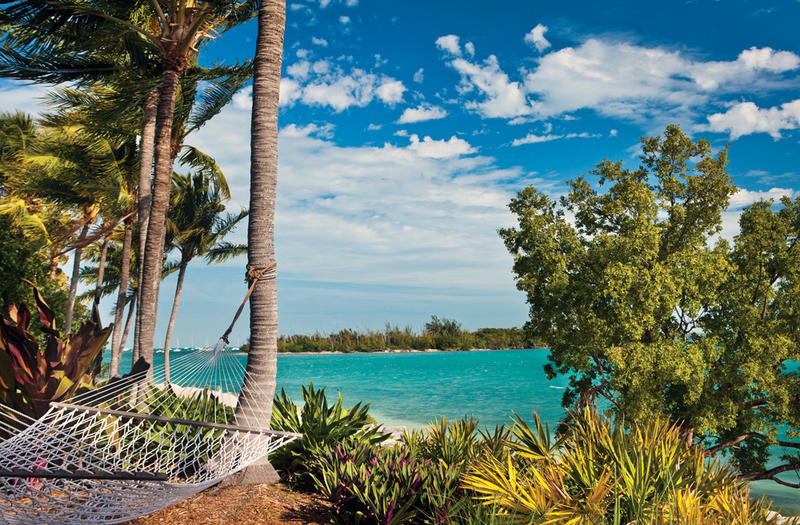 Why go: Key West is fun on many levels, but sometimes it’s good to step away from the southernmost island’s colorful, boisterous streets and retire to a gentler place—particularly when traveling with small children. Sunset Key is a seven-minute boat ride from Key West, but it’s a whole other world. 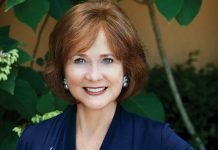 Think pastel-colored cottages with lap siding and metal roofs, thatch umbrellas on private beaches, and ice cream carts rolling down cobbled streets. For families, it is heaven. And the fact that it was named Travel + Leisure magazine’s No. 1 U.S. resort last year doesn’t hurt, either. 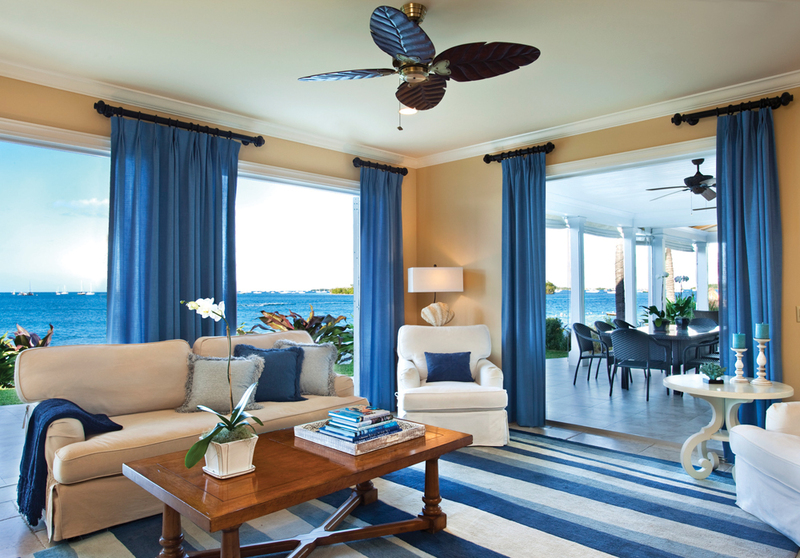 Family retreat: Sunset Key cottages, which come with one to four bedrooms, are akin to private beach houses with full kitchens, living and dining areas, wide porches, and seaside-luxe appointments. The four-bedroom has its own pool and picket fence-enclosed garden. A wonderful amenity with all cottages is the daily breakfast basket service. Hampers full of pastries, fruit, yogurt, and juices are delivered to your front porch so you can laze on the veranda and admire the morning light while the kids play by the surf. 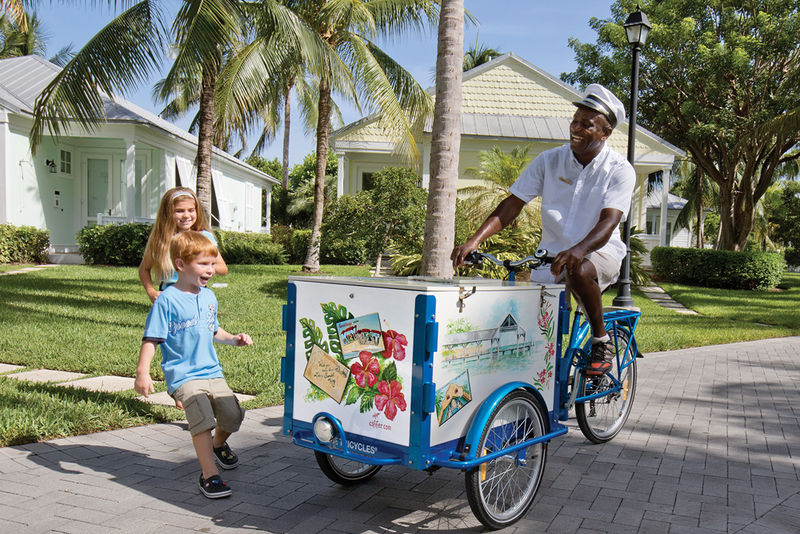 Kids also will adore the new Conch Cruiser ice cream cycle. Because no motor vehicles are allowed on the island, frozen treats are peddled by pedal. Every day at 3 p.m., the familiar bell rings, calling children to the icicle bicycle like a siren song. The treats are complimentary, and the scene is straight out of a Norman Rockwell painting. The Conch Cruiser delivers a sweet snack. Wining and dining: The beachfront Latitudes is probably the best restaurant in the Lower Keys, and we don’t proclaim that lightly. Part of it is the elevated tropical cuisine, which changes with the seasons and always incorporates locally caught fish and fruit from the backyard tree. Don’t pass up the saffron-crusted black grouper, a gift from local waters. 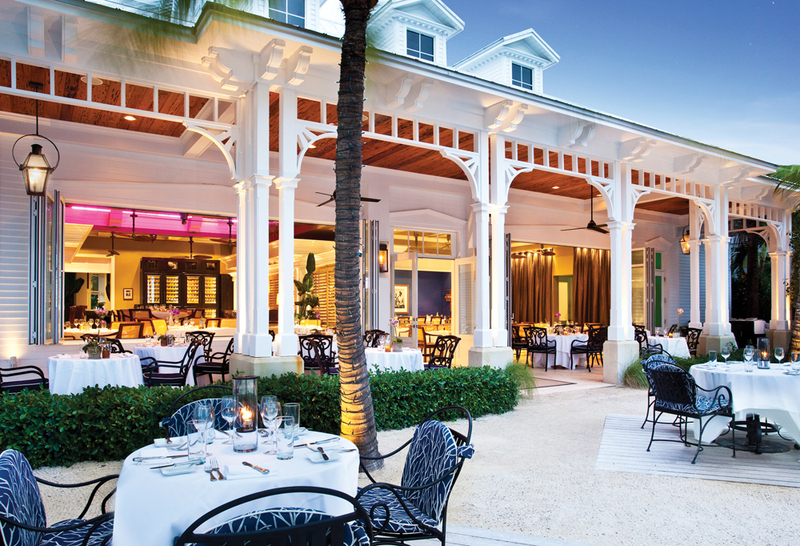 Every meal is better by the water, and Latitudes has that island vibe in spades. The tables are perched on the sand beneath the shade of palm trees so close to the water you can hear the surf’s ebb and flow. And the reason you come to Sunset Key in the first place—the sunset—is fierier here than anywhere else. Prepare to be mesmerized in the best possible way. 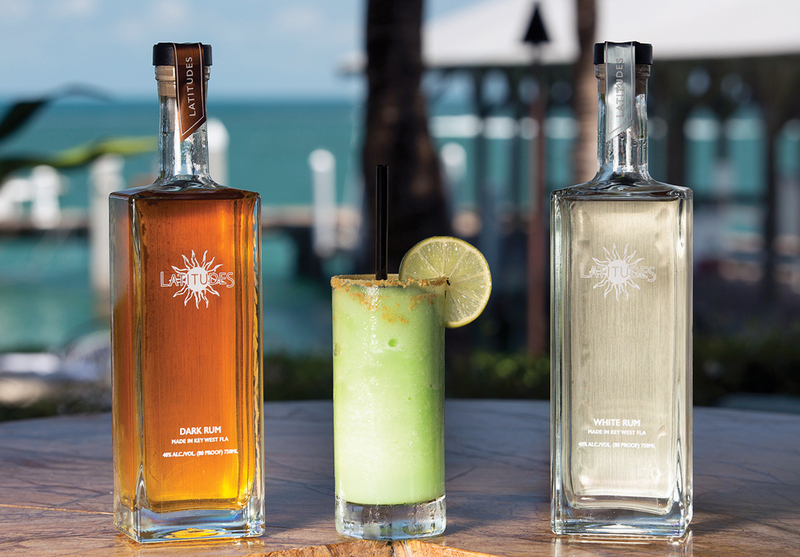 To pave the way to the enchanted evening, Latitudes offers a daily rum call. Every afternoon at 4:30, the faithful gather at the outdoor bar to sample locally distilled rum or enjoy the rum cocktail of the day. What to do: If lounging on a white sliver of beach isn’t enough stimulation, grab a fishing rod and some bait from the concierge and hit the docks. Chances are you’ll snag a few yellowtail and mangrove snappers. If you’re lucky, a barracuda will come along and shake things up. 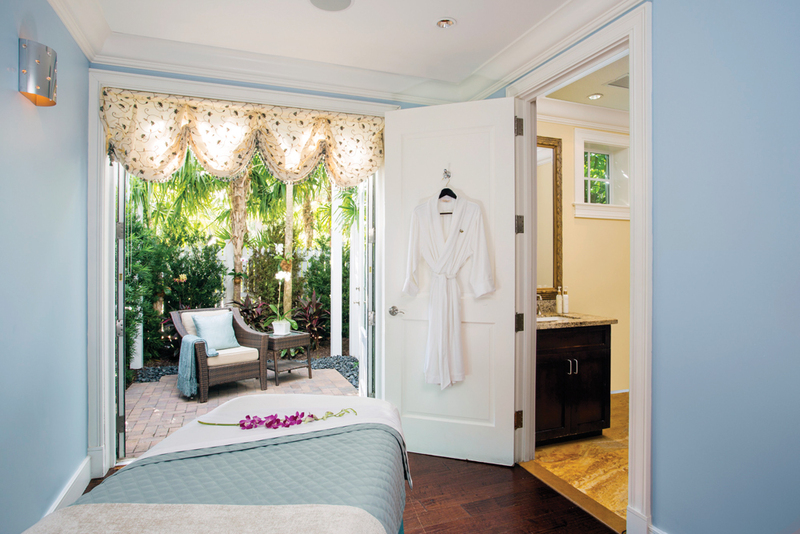 Sunset Key has a small but effective spa, where you can partake of treatments like the Salts of the Earth scrub. The minerals—84 of them—come from the Dead Sea, the Himalayas, the Utah desert, and the Bolivian coast and work wonders on tired, parched skin. Off-island, we recommend a behind-the-scenes tour of the Mel Fisher Maritime Museum in Key West. The museum itself is well known for its artifacts from Spanish galleon shipwrecks, but its conservation facility is a hidden gem. The lab tour reveals the treatment and conservation of 100,000-plus archaeological treasures. Other Key West landmarks worth visiting: the Key West Historic Memorial Sculpture Garden with statues of Cuban leaders who influenced the Conch Republic’s history, and the Custom House built in 1891 using 917,000 bricks and now housing the Key West Museum of Art and History.